Rev. Lien Ngoc To, 86, formerly of Carthage, MO, passed away Sunday, March 10, 2019 at Hope Creek Care Center, East Moline. Visitation will be Saturday, March 16, 2019 from 9 – 10 a.m. at Christ the King Church, Moline. A Mass of Christian Burial will be celebrated at 10 a.m. Saturday at church. Burial will be in St. Mary’s Cemetery, East Moline. Fr. Lien was born April 30, 1932 in Ninh Binh, Vietnam, the son of Nhuong and Lieu (Nguyen) To. 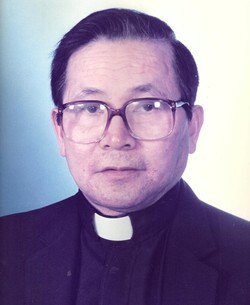 He was ordained into the priesthood in 1962, and served as a pastor at Kim Thuong Parish in South Vietnam. He studied in France and earned doctorates in psycho-sociology and psychology. Fr. Lien’s ministry in the US started in the 80’s where he served as the associate pastor at the Cathedral of the Sacred Heart, and then the associate pastor of St. Anne’s Parish in Pensacola, Florida. Over the years, he also served as the director of the Vietnamese Apostolate in Biloxi, Mississippi, and the associate pastor at St. John the Baptist Catholic Church in Edmunds, Oklahoma. He devoted his entire life to various charities. He is survived by his brother, Duc To (Hieu To), sister Lan To, sister-in-law Hanh Dao, and nieces Julie Locke and Michelle Greuel.